Iraq declared victory over ISIS. But the fight isn’t over. As major combat operations against the Islamic State terror group wind down, both Iraqi and coalition forces must shift their work to rooting out sleeper cells, providing humanitarian aid and training forces for different missions, a top State Department official and a British general focused on defeating ISIS said recently. Retired Army Lt. Gen. Terry Wolff now serves as the deputy special presidential envoy for the Global Coalition to Counter ISIL, or ISIS. Wolff recently spoke with members of the Association of the United States Army about where the fight against ISIS stands. British Brig. Gen. Frazer Lawrence, deputy commanding general for the Combined Joint Forces Land Component Command, spoke recently with Military Times about gains against the terrorist organization and what remains to be done as forces adjust their mission. Wolff painted a picture of a nearly fully liberated Iraq, with 89 percent of ISIS territory retaken by Iraqi-led forces in Iraq. In Syria, coalition forces have regained 87 percent of territories, as of the most recent data. And on Dec. 9, Iraqi Prime Minister Haider al-Abadi declared victory in the more than three year fight against ISIS in a national address aired on Iraqi state television. The announcement came as Iraqi forces retook the last ISIS strongholds in Iraq’s western deserts earlier that day and secured the country’s border with Syria. But those regained territories have come at a cost over the past three years. “This sort of damage we haven’t seen since Korea or World War II,” Wolff said. And ISIS fighters took advantage of the time they controlled those areas, leaving devastation in their wake and serious problems for those who retook the land — mines. But with 91 refugee camps in Iraq and others in Syria, there are people waiting to return home as areas are declared safe in parts of Mosul and other population centers, Wolff said. The focus is now shifting more and more toward humanitarian aid, such as reestablishing services, he said. For the military arm of the fight, some areas in the north remain under ISIS control, but all the major population centers — accounting for 4.5 million Iraqis and more than 50,000 square kilometers of territory — are back in control of the Iraqi forces, Lawrence said. 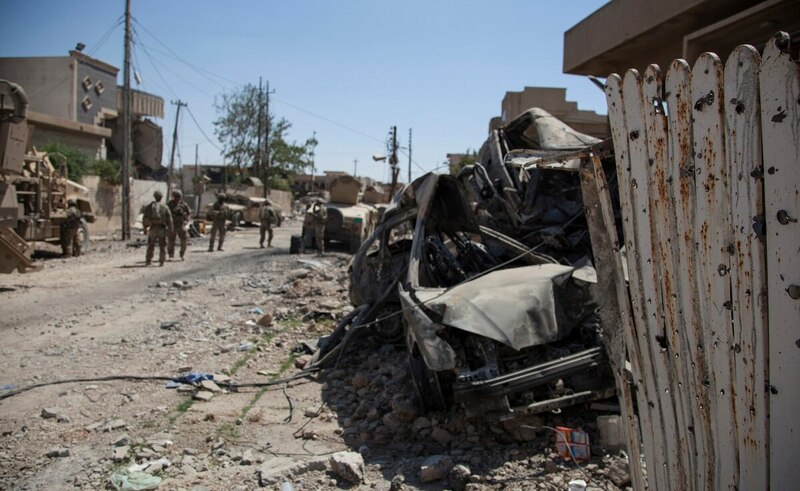 As direct-action forces, including an Iraqi division, finish that work in the north, other units are now working to root out “ISIS sleeper cells” that have hidden within the population following the end of major combat operations in territories such as Anbar Province, Lawrence said. At the same time, coalition forces look to re-evaluate their footprint and move resources from supporting direct action to building professionalism among the Iraqi ranks. The main role of coalition forces in battlefield operations is to establish security in liberated areas as the Iraqis continue the fight elsewhere, he said. At this stage, the units are in a “consolidation of gains” phase. With decades of operational experience, Lawrence declined to specify whether there were enough coalition forces to support all the work, from demining to direct action to retraining and security, saying only that prioritizing forces is always a challenge. “We aren’t in the lead, we are assisting them,” Lawrence said. He called the current position a “constant mentoring” approach. “This allows them to develop … [which is] a real key part of allowing them to provide long-term stability,” he said. Earlier concerns following the battle for Mosul that as many as 40 percent of Iraqi Special Operations Forces had been lost or reduced due to battlefield casualties hasn’t hurt recruiting, Lawrence said.